In this DVD you get 2 episodes of Hermie fun! No matter the situation, it is always important to be kind to everyone. In "Milo the Mantis Who Wouldn't Pray, " a big storm sweeps away Milo's Snack Shack and he just doesn't know what to do--not even how to talk to God about it. He thinks he has to get God's attention so that God will answer his prayers. Milo finally learns, with the help of his friends, that even though you can't always hear God, He always hears our prayers and answers them. God is always paying attention and we can talk to Him anytime. In "Antonio Meets His Match," a new group of foreign ants have moved into the garden, and the other garden bugs, especially Antonio, find their new neighbors pretty annoying. When God asks Antonio to love his neighbor, he has to learn to use something other than his physical strength and military experience to solve his problem. Eventually Antonio and his new neighbors learn that despite their differences, it is best if they stick together and learn to be kind to each other. This lesson is based on Luke 10:27 "Love your neighbor as you love yourself" (ICB). 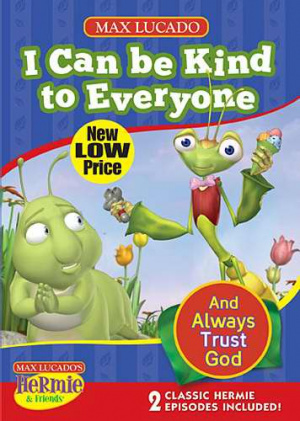 I Can Be Kind To Everyone DVD by Max Lucado was published by Thomas Nelson in September 2013 and is our 15340th best seller. The ISBN for I Can Be Kind To Everyone DVD is 9781400323487. Be the first to review I Can Be Kind To Everyone DVD! Got a question? No problem! Just click here to ask us about I Can Be Kind To Everyone DVD.